In September 2000, in the United Kingdom, there was a nationwide fuel shortage. The roads fell silent as cars and trucks sat around with their engines in hibernation. However, the British public were already used to gasoline which cost as much as wine, so thousands of them were able to continue upon their merry way astride their motor scooters. Every tree, parking meter and light pole in London seemed to have a scooter chained to it, and the lanes were abuzz with cute little designer items from not only Italy, but also Spain, Taiwan, China, Korea, France, Japan and India. Motor scooters exist only in fiction for many Americans. Long distances, cheap fuel, and air pollution laws that preclude the use of two-stroke fuel mixtures have rendered them almost permanently into the history books. But now as the century begins in 2001, the scooters are back. They never completely left. When the two-stroke ban kicked in, the cool scooters (the Vespas) went away and all that was left were the four-stroke, plastic Hondas and Yamahas. Short on style and rather un-cool, they didnt sell in sufficient quantities to make their presence felt. The re-introduced Italian Vespa line up, however includes a 50cc two-stroke that actually passed the pollution test and is legal in California. Thanks to Piaggio, the parent company of Vespa, Americans can again buy scooters that are cool and un-embarrassing to be seen upon. Its a retro thing. The only stumbling block to a takeover of the streets is the difficulty of obtaining a motorcycle license. In the United Kingdom, a car license lets you ride a 50cc scooter. In the U.S. you have to go and take a test. And thats a real hassle for Americans who are used to impulsively buying a vehicle such as a car, and legally driving it off the lot. 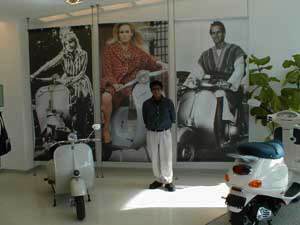 On the last Saturday of 2000, the-vu visited Vespa of California Inc., a brand new, beautifully designed showroom in Sherman Oaks (Los Angeles) and talked to helpful sales associate Eddie Alcazar, himself an owner of several scooters including a 1954 Model D Lambretta, a 1967 SX200 and an array of 1978-79 P200 Vespas. Hes owned Vespas from the 50s, 60s and 70s, and has ridden, restored and lived with scooters for eleven years. His first scooter was a light blue 1964 Vespa 90 which he bought at a garage sale for $40 in the late Eighties. Regarding that two-stroke issue, Eddie explained that California Emission Laws banned the selling of new two-stroke vehicles in the early eighties, and since all the Vespas were two-strokes, Vespa withdrew from U.S. soil. Around 1997 the off-road bikes that burned two-stroke were also banned, outside of racing on a track. In the new Vespa model line up, the ET4 has a 150cc four-stroke motor, and the ET2 has a 50cc two-stroke motor, which has been retrofitted for the American market to meet American emission standards. Today the scooter, tomorrow the leaf blower? The two Vespa scooters look identical. Only the badges look different. They are displayed in a showroom that has some serious design behind it. Feeling more like a clothing store than a vehicle dealership, Vespa of California displays and sells Vespas in all colors, clothing, retro-helmets and bags, purses and accessories that would not look out of place on Rodeo Drive in Beverly Hills. The showroom has green glass displays that would look respectable in a museum of art and they make espresso and cappuccino for the customers. The owner of the Vespa boutique has a collection of bubble-cars and micro-cars and there is a service facility behind the showroom. 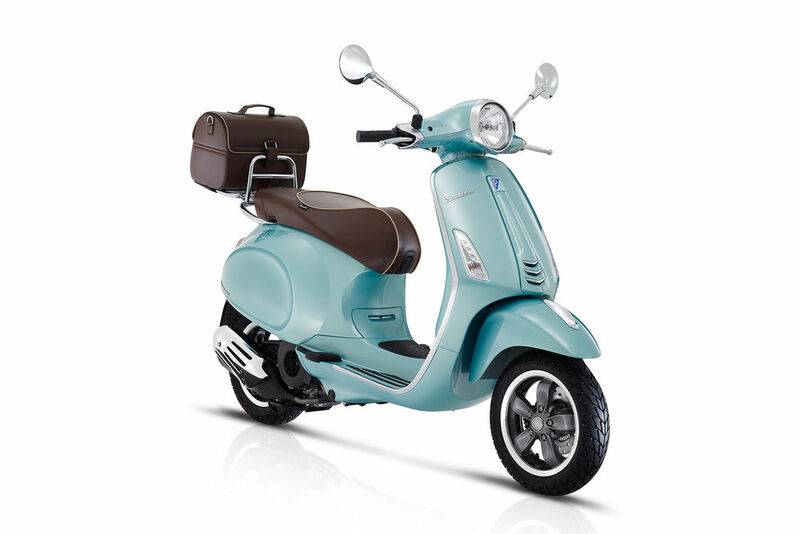 The new Vespas sell at just under $3,000 for the ET2 and just under $4,000 for the ET4. 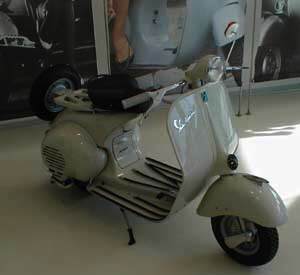 In the corner of the showroom is a 1961 Vespa. How do the new Vespas compare to the old? Eddie explains that the main difference is the twist-and-go automatic transmission on the new scooters. While these are easier to ride, only the old models with the clutches allow you to pop a wheelie, and some riders miss that. Wheelie poppers now have to purchase motorcycles. The disk brakes on the new scooters make stopping a much more efficient enterprise, however, so riders can pop a stoppie. What about fuel economy? The 150cc ET4 gets around 55MPG on 92 octane and the 50cc ET2 gets around 80MPG on a mix of 92 octane and two-stroke oil. The frame and the body are stainless steel, not plastic. Steel frames give stability. Eddie says certain colors; such as light blue sell so fast they cant keep them on the sales floor. He wouldnt quote an actual figure, but apparently scooter starved Americans are attempting to make up for the temporary absence of scooters on the streets. These things are flying out the door and into the San Fernando Valley. Outside of Harley Davidsons and Indians, the Vespas are set to become the most accessorized two-wheelers in the U.S. The boutique is full of desirable Vespa accessories. Most impressive are the rigid backpacks, which also provide protection for the spine in the event of an accident. As Eddie shows us the range of body contoured shoulder bags, Vespa mechanic Robert with logo emblazoned overalls emerges from the back of the store. He is not oily, but infuses the essence of racing team into the boutique. As the photographs for this article are taken a teenage couple scoot onto the sidewalk outside on a seventies Vespa. They look like theyre right out of an Italian movie. Inside the store we meet Jim Cavanaugh and his wife Ronnie, who are looking to buy a pair of Vespas to ride around the Valley on. They are replacing two ugly old Honda 50s. Yesterday they looked at new Hondas and today they are buying two Vespas. Its the quality and the general beauty that persuaded them. They are lingering over the decision of color. Two red ones or one red and one ivory? Readers hold on to your wallets however. There are a few things you need to know before you decide to be a motor scooter rider. Firstly, are you prepared to abandon the freeway system and take surface streets everywhere? The 150cc Vespa is freeway legal, but do you really want to be at full throttle with a Ford Excursion as big as an elephant five feet from the back of your head on the interstate? If you want to be safe on the freeways, you need a real motorcycle capable of 90MPH with a twist of the wrist. Its the speed and acceleration that can save you in an emergency. Scooters are for surface streets. Designed originally for the narrow and ancient roads in Italian towns, they are safe and comfortable on the boulevards of America, zooming from one red light or stop sign to the next and weaving through the rush hour traffic. The only other safety consideration is wheel diameter. Motorcycles have bigger wheels that can take the occasional pothole without too much trauma, but you have to aim your small-wheeled Vespa for the smoother parts of the street to avoid any explosive losses of control. 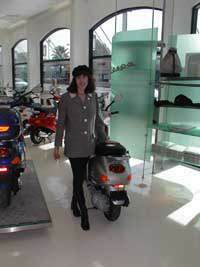 We pose retro sales associate Amy for one last shot and then leave in our car, considering if we can get away with buying some Vespas for fun. If a million Brits can do it in their lousy weather, what are we Southern Californians waiting for? 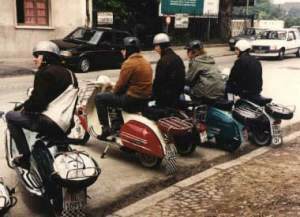 More Vespa boutiques are planned in San Francisco, Miami, Chicago and Houston.